Once again, all the Hammett tours this month are being done for groups by appointment, but check back from time to time — any extra tours open to the public will be posted here. Or if you can hang in there until May, you’ll get a walk every Sunday in the month. In retrospect, last month feels like it was a solid round of parties. The boxer-poet/writer-fighter Floyd Salas hit 76 years on the mean streets, current noir master Jim Nisbet turned 60, and the NoirCity 5 festival at the Castro Theatre gave Don an excuse to hang out with Eddie Muller for some after-show drinks. Eddie (age unknown) just took over as the mystery reviewer for the San Francisco Chronicle and you can find his finished columns posted on his website. A brutal job, but someone has to do it. No less a presence than Dennis McMillan hauled into the berg for Nisbet’s birthday bash, and mentioned that he is thinking seriously about doing another massive anthology to celebrate when his press reaches its twenty-fifth anniversary in a year or two. 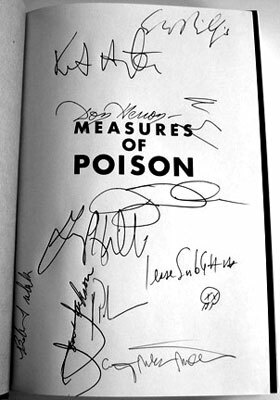 One of Don’s favorite books is Dennis’ twentieth anniversary anthology, Measures of Poison. Don had a neo-Black Mask story in that one, and even attended the Bouchercon in Austin for the book’s debut in 2002, signing copies along with ten other contributors also in attendance. Top right corner: Scott Phillips --- top leftish: Kent Harrington --- Don’s signature easy to read above the title imprint --- to the right of Don’s name the initials “M C” at an angle, that’s Michael Connelly --- the loopy loops autograph right below the title belongs to James Durham --- just below Durham is Gary Phillips, his holograph almost recognizable --- to the right and somewhat below Gary is Jesse Sublett, likewise readable, and he also drew the little skull thingy --- in the far left gutter signed up and down is Bob Trulock --- same angle up and down just right of Trulock is Jon A. Jackson, also almost readable --- at a regular angle next to “Jackson” is another “initial signature”, that from George Pelecanos --- bottommost name is Craig Miles Miller. 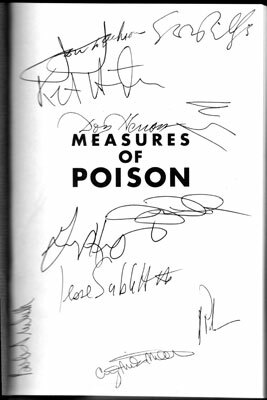 Top left: Jon A. Jackson --- just below Jackson is Kent Harrington --- top right, Scott Phillips --- Don’s signature still legible above title imprint --- the “M C” to the right of Don’s name still Michael Connelly --- James Durham loopy loops still below title imprint --- Bob Trulock holding steady in the left hand gutter, signing up and down --- then these signatures in order below Durham: Gary Phillips, Jesse Sublett, George Pelecanos and Craig Miles Miller at the bottom. For those of you who remember the glory days of Creature Features on Channel 2, former host John Stanley (1082 Grand Teton Drive, Pacifica, CA 94044) is bringing out the new book I Was a TV Horror Host at the end of the month, covering the years he and the legendary Bob Wilkins piloted that late night horror fest through the airwaves. 556 photos. 210 pages in an 8 x 11 format. $25 plus $3 postage and handling. Includes interviews with the pre-governator Ah–nold, Leonard Nimoy, William Shatner, Ray Bradbury, Elvira, Vincent Price and many more — and apparently Don himself is going to make an appearance, courtesy the short film The Attack of the Incredible Killer Scarecrow he shot as a mini-feature for the show many moons ago. Don appeared on the program several times, and was on hand for the very last episode ever aired. Those were the days — now resurrected for CF fans everywhere. This entry was posted in DMac, Film, Frisco, News, Tour and tagged Bob Truluck, Craig Miles Miller, Creature Features, Eddie Muller, Floyd Salas, Gary Phillips, George Pelecanos, James Durham, Jesse Sublett, Jim Nisbet, John Stanley, Jon A. Jackson, Kent Harrington, Measures of Poison, Michael Connelly, Noir City, Scott Phillips. Bookmark the permalink.